Raphaël Lance took this opportunity to explain the part played by the Fideme fund in launching the wind energy industry in France. In view of the immature technology and fragmented project market, with no access to senior debt, our Fideme fund relied on a €15 million investment by ADEME which enabled us to raise a further €30 million from private investors. Project company financing through the Fideme fund took the form of mezzanine debt, coming in between the developers’ equity and the ‘project financing’ bank debt. As the fund took part in financing projects totalling €320 million in investments, the multiplier effect of public funds came in at around 21x. - virtually no development risk. 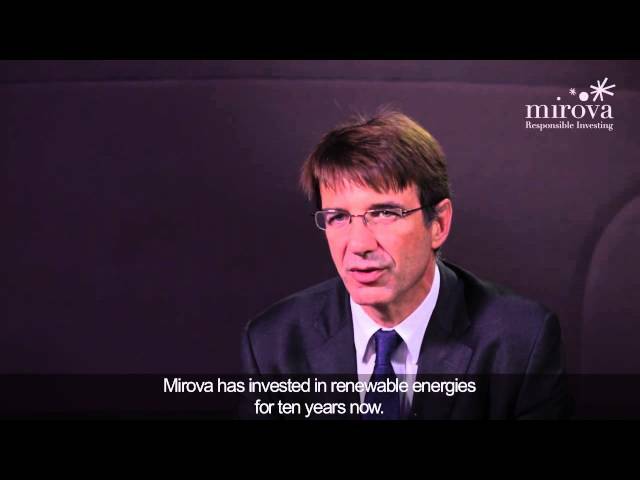 Mirova Environment and Infrastructure, a fully-owned subsidiary of Natixis Asset Management, is an investment fund management company specialising in project financing for renewable energy infrastructure in Europe and public private partnerships for a wide variety of projects in France (universities, hospitals, urban transport, etc.). Its 4 funds (Fideme, Eurofideme 2, Fideppp and Fideppp 2, Mirova Environment and Infrastructure) represent a total commitment of over €360 million* in infrastructure projects as of 30 June 2013. The funds managed by Mirova Environment and Infrastructure are not subject to the approval of the French Financial Market Authority (AMF) and may adopt whatever investment rules outlined in the prospectus. Prior to any investment, investors must check that they are legally authorised to invest in a fund; in particular, investment in funds managed by Mirova Environment and Infrastructure is strictly reserved for professional investors in compliance with the criteria stipulated in their prospectus.